Status: Manager of the Southern Highlands. Piers J. Anthony (aka Hyper or Anthony) is the current Manager of the Southern Highlands, SW City. He is a young, yet noted politician and leader across the A-W System, as he is the founder of New Arklay City and was once a caretaker of the nearby planet Teen. Anthony is also the C.E.O. of a new corporation, Antworks?. Anthony is a Gray that was born on Mars in 1990. Throughout his early years he lived a relatively peaceful life, but after the Circle of Fire Corporation? 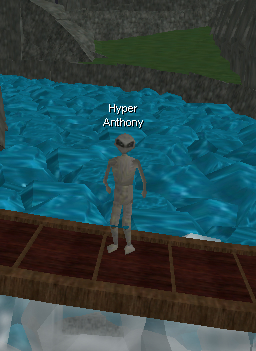 made contact with the Grays in 1996, Anthony was among the the first of the young Grays sent on by the Martians on diplomatic trip throughout the A-W system. During this time he was exposed to many cultures and languages, and was becoming a charismatic individual that would shape his future political career. Towards the end of 2002 the Martians had become well integrated into galactic culture, and Anthony sent back to Mars. In early 2003 he had matured enough to become independent, and left Mars for the last time to explore the universe on his own. He was reported to traverse many spaceports at this time, and for a span of several months isolated himself on the Dark Island of a rural world named Mutation in the R-P system. During this time Anthony lived among the militant peoples of the world, and spent several months working with them to defeat a local menace named To'Rak. Anthony was among the adventurers that finally brought the demon to defeat, and after the celebrations left the R-P system and came to settle temporarily in Teen world. He started a minor settlement there while simultaneously beginning a daily commute to a small world that hosted the studios of Virtual World Television, as he picked up a minor, low-paying job there. By late 2003 Anthony was earning a meager wage at VWTV cleaning windows and birde poo, and became enticed by the glitz and glamour of the big screen. Determined to work his way up from Studio Janitor, Anthony befriended a red-feathered birde native to the small planet named Fred, and the duo arranged themselves to the station as the characters of a dopey, incompetent protagonist (Anthony) and his cynical, homicidal traveling companion (Fred). The two were an instant hit, and began working their way into the station as entry-level actors. Throughout the year of 2004 Anthony traveled across the universe with VWTV, filming on-location and performing his popular act with Fred. He was eventually entrusted with more responsibilities and put his various talents he learned as a Martian Diplomat to work, using skills in carpentry, landscaping, and event-planning to craft new studio lots and events for the television network. These events were wildly successful, and after half a year Anthony found himself sitting in the seat of a Senior Staff member, the highest rank achievable in the organization. Anthony's career in VWTV marked his first exposure with residents of SW City and the Scarabian Republic in general. He befriended SW Staff members Dane E. Esperion and Ferruccio Benedetto, and worked closely with them as his experience with the station grew. The station would go on to receive a Cy Award in 2004, but unfortunately was later dissolved because the senior owner of VWTV, William S., left known space. Disheartened by the sudden end of VWTV, Anthony had returned to his old settlements on Teen world in September, 2004, and began minor carpentry work in isolation. Around this time he also begun freelance journalism as a hobby for AWNews, a weekly publication in the system. These alone did not satisfy him, though. Now in charge of a substantial amount of wealth due to his position in VWTV, Anthony revisited the idea of planting a settlement. In November, 2004, Anthony purchased large tracts of land in the southern extents of Teen world, and planted New Arklay City. The heavy promotion of the new town and Anthony's various social contacts drove the city's initial success, but Anthony did not want the city to stand-alone. This prompted him to travel to Alphaworld and arrange a meeting with the leaders of the Scarabian Confederation, requesting that his city become a part of the Confederation. After a month of deliberation, the SW'ian core agreed and New Arklay City became the first city off of Alphaworld to be admitted into the Republic. Throughout the year of 2005 New Arklay City saw major expansion, and quickly became a prominent area of activity in the world. New Arklay joined up with smaller villages, townships, and leaders across the area and rose among the largest city-states on the planet, along with other cities such as Moonlight Heights and the Kingdom of Parkhaven. The powerful leadership and drive of the growth New Arklay experienced intrigued the world leadership, and by 2006 they approached Anthony with an opportunity to enter the Caretaker Triumvirate, three world leaders that controlled the government and administration of the world. Anthony accepted this opportunity and New Arklay experienced new growth as the full backing of the world leadership was now behind the town's growth. All was not well though: the town began having internal conflicts among its managers and governors concerning land ownership and authority. The city grew into a period of unrest, and conflict among the different regions of the town seemed around the corner. The issues of land could not be resolved through diplomatic means, and by mid-2005 the failing direction of the city had become frustrated beyond recovery. Anthony stormed out of his city hall office, denouncing his mayorship and left New Arklay to seek refuge in SW City. A contingent of loyalists also followed him, and in the following period New Arklay scrambled to elect a new mayor, Jaguar Hahn. Although discouraged by the flight from New Arklay, Anthony had grown fond of town leadership and wanted to start anew. He brought his plight to the many friends he had made through his relationship in the Scarabian Republic to the core of SW City, and was granted a significant parcel of land in the southern territories of SW City for the refugees from New Arklay City to re-establish themselves in. The refugees, Anthony included, were extremely excited about this new land and organized an expeditionary trip to the area. Setting sail from Port Cobalt in June, 2006, the refugees sailed across the Irenic to the new land and re-discovered the old pirate town of Obsidian Cove after a perilous journey through the rocky seas along the coast. The refugees disembarked in Obsidian Cove and upon initial explorations throughout the cave found an exit into the overworld. The haggard refugees re-entered into the sunlight and discovered a vast, overgrown, mountainous wilderness. Anthony was stricken by the beauty of the region, and stated to the refugees that their new settlement here would not interfere with the beauty of the lands they had found. He was enamoured with these new lands, and named them the Southern Highlands for its location relative to SW Island and the geographical features of the land. After relinquishing his authority of world leadership on the planet of Teen in early 2007, Anthony devoted the majority of his time organizing the new settlement in the Southern Highlands. Named Obsidian Cove after the old pirate town that it is built over, this new urban area is the only settlement on the southern shores. Anthony is currently working with Rising Glen to allow residents into the hinterlands of Obsidian Cove. In his spare time, Anthony otherwise enjoys adventuring with his old friend Fred, writing for AWNews, and careening large vehicles over the cliffsides of the highlands.